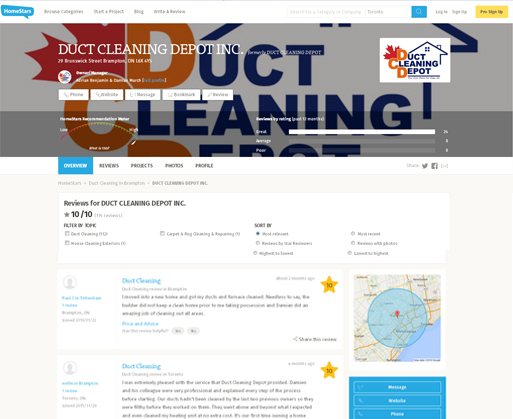 Our family owned and operated business delivers dependable, timely and quality Duct Cleaning and Dryer Vent services to the GTA. We service Aurora, Brampton, Burlington, Caledon, Etobicoke, Markham, Maple, Milton, Mississauga, Newmarket, North York, Oakville, RichmondHill, Scarborough, Thornhill, Vaughan, Whitby and other areas in Ontario. We are constantly upgrading our skills and technology to be on the forefront of our industry. We strive to provide a new outlook and perspective on duct cleaning by providing the community and our customers with safer, healthier quality air. There will be an initial walk around throughout the home so that the technicians can estimate how long the process will take and decide on prepping and setting up. Pets are very sensitive to noises; we would like to have any pets that may run away to be secured before we start. The technicians will assess your HVAC system; the furnace and humidifier before any work begins. Clothing dryers have been a major appliance found in homes around the country for more than four decades. Many homeowners depend a great deal on these appliances to help provide a more convenient method for completing the task of drying their clean clothing. Unfortunately many times residential property owners do not address the necessity for properly maintaining the dryer vent attached to these appliance units. The idea of nest removal is to not only physically remove the nest and its eggs, but to also inhibit habitual imprinting – thus preventing the return of the young and their parents to your site. Parents will return to a successful breeding site and their young will return to their birth place. This cycle must be broken in order to permanently remove the birds from your property. Our commitment is to our customers’ needs and our mission is to have our family working for your family cleaning your home. Our goal is to achieve a healthier, cleaner and a safer indoor environment for you and your loved ones. We promise to deliver a level of service that will keep our customers satisfied at a fair price. We will provide a dependable, timely and quality service with 100% customer satisfaction. We will always operate with full transparency about our Duct Cleaning process and practices so that our customers are well equipped and educated to maintain their HVAC system long after we are gone. We offer professional Duct Cleaning and Dryer Vent services throughout the Greater Toronto Area by following and adhering to the strict standards, policies and practices and set out by NADCA. Our goal is to provide Duct Cleaning and Dryer Vent service with a 100% satisfaction. When your family needs HVAC System Cleaning or Dryer Vent Cleaning; you will receive the highest level of dedication and professionalism in the industry. We take pride in giving you the best air duct system cleaning service available. Our service technicians are trained in the latest air duct cleaning techniques. © 2016 copyright Duct Cleaning Depot 201. All rights reserved.